Plugin creates image with a given text using specified font. Image is autocropped to text size. Size flag — flag for appending image size to the filename in the form filename-WxH.ext, where W is a width and H is a height. # gimp -i -b "(python-fu-text-to-image RUN-NONINTERACTIVE \"Sample text\" \"Arial\" 100 '(0 0 0) '(255 255 255) 100 \"filename.png\" 1) (gimp-quit 0)"
goes to current directory into file with name filename-524x93.png. The GNU General Public License (GPL), Version 2. 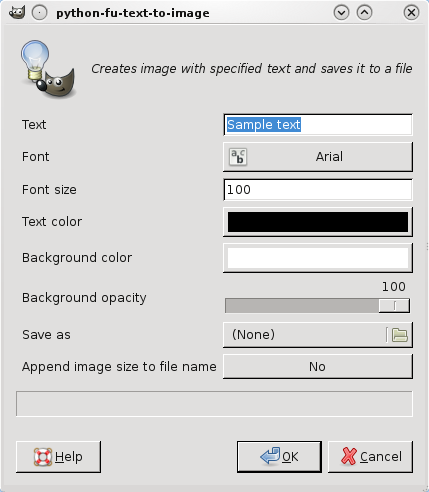 Current version: Plugin text-to-image 0.2. Download the script, put it into ~/.gimp-2.n/plug-ins, set executable bit on it.